No doubt about it, Right Michigan’s numbers have been consistent; recently averaging 200 sessions a day from the wolverine state alone. 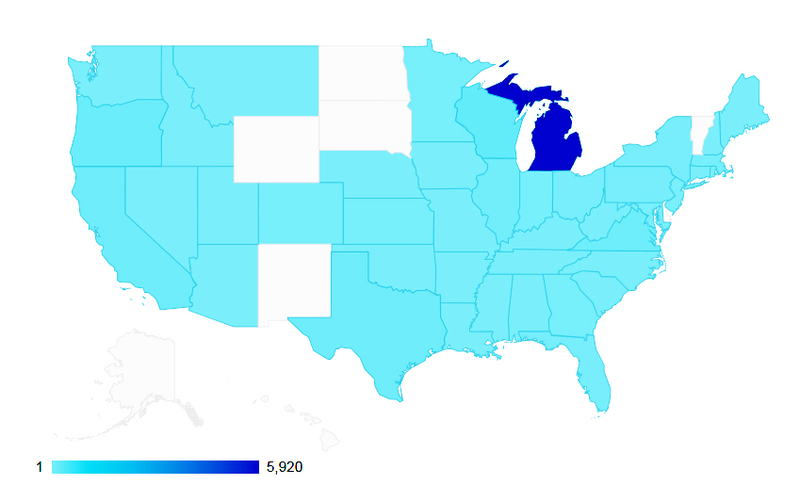 This RightMi.com snapshot (at right) of the past 30 days reflects about 85% of the traffic coming in from all over Michigan. Wisconsin, Oregon, California, Texas, Viginia Illinois, Ohio and Florida coming in with the next highest numbers. Though the actual page views are up and visits are longer, the actual session numbers are off slightly this month, since reaching an average of 308 sessions per day in Michigan for the month of August. The high locale in Michigan for August was Traverse City followed by Ann Arbor Lansing and Grand Rapids. I thought it might be interesting to those who wonder where RightMi.com’s readership is primarily from.